Our memory is limited, memories fade, we lose them. Human beings have always told each other about events and experiences from former times, recorded the past in songs, stories and poems, in pictures and monuments, human beings have preserved buildings, protected architectures, created libraries, museums and temples, they have led out cemeteries to think of their ancestors and have consciously searched for the past, have struggled to preserve in the pre¬sent what has been. We do so, because we feel that our present life is embedded into a process, which that is rooted in the past and goes on actually inconceivably into future - whatever it may be like. The conditions of today's existence are the results of the lives of individuals before us. Knowing that our existence is temporal, understanding the perspe¬ctive of life as a transition of the past, present and future - we think of Hildegard Moniac and Johanna Elberskirchen today, two women, who actively shaped their lives here in Rüdersdorf and other places who both went on their individual ways and left traces, traces, which let us know that they both accepted the challenges of their time and faced the personal, professional, political and academic tasks, which the social situation at that time brought about. Both pursued their professional perspective brilliantly and both - that is important - lived their individual happiness - even in intolerant times - as a homosexual couple. The politicisation of sexuality in connection with feministic analysis has been a milestone in the history of women's liberation. 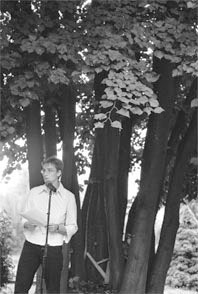 Johanna Elberskirchen brought up these topics for discussion openly and actively at a time, in which women were just beginning to emancipate themselves from being perceived from an exclusively male viewpoint, to look for their own vision of the “woman as an active person of society”, to demand and to shape it. I think this process of emancipation is still persisting in spite of the increasing participation of women on many levels of social life. Above all it is persisting close to and in the relationships of human beings. This process is being reproduced again and again and develops constantly again out of the predominant direction of the social and technological development, which in its starting point not really differs from ear¬lier social basis. Perhaps women and men will be able to emancipate only if the interpre¬tation of what is to be the “sense of life” is questioned, if they can move in a free way  especially concerning aspects as “humanity”. To achieve that the removal of poverty is required, stability in society and social life, education, culture and above all peace is required. "At present women suffer from an enormous setback and lose many of their rights, which achieved in the course of a long and hard fight they have laboriously... in most countries poor women are among the first victims of economic and military crises...."
Because of that and as we know it, we can perhaps gather power and ideas, meditation, orientation and motivation from women, who began this fight. And if we understand ourselves as descendants of these and other female and male human philosophers, we can judge the present in a better way and will be more able to invest into a human future in the east, south, west and north.